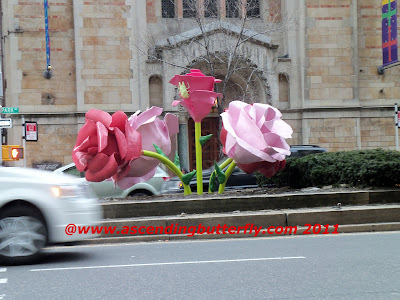 Ascending Butterfly: Wordless Wednesday - Flowers Invade Park Avenue! I was on my way to the Fisher Price event at The Loews on Park Avenue when I came upon these flowers and couldn't resist taking a picture of them! Just something cheery to make a busy day in New York City brighter! Inspiration Dear Butterflies really can be found everywhere! Beautiful... and unexpected. Must have been a fun surprise. Those photos are sooo cool. You live in a great place with amazing opportunities! I've struggled with trying to find opps here in the middle of nowhere. I'm over an hour awy from the cities! Such a bummer. @bigguysmama Does your city have an events board? Maybe even your local radio station? Sooo true!!! I like that. Great WW post! Oh wow what a nice surprise! After this winter we east coasters need something like this. Lets hope the real thing comes soon! @Tracy - I thought the bug was a great touch too! Your post is great, and I made sure to tag it on Mor's Facebook Page so they could see it too!